Sunday Feast ~ The Toronto Hare Krishna Temple! 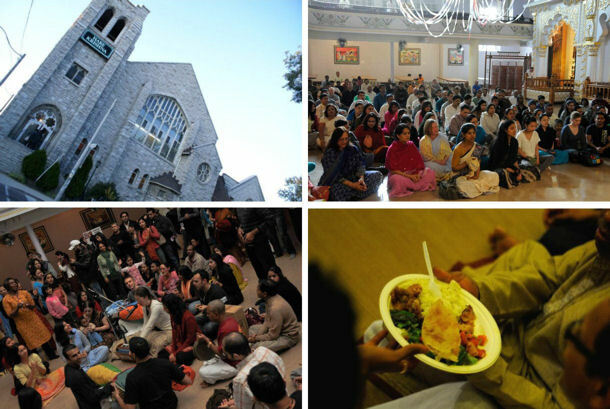 Toronto’s Hare Krishna Sunday Feast – A Free Spiritual Gathering! Toronto’s famous Hare Krishna Temple would like to invite you to our weekly Sunday “Love” Feast. Every Sunday evening, spiritual-seekers gather for a culturally rich and vibrant experience of traditional spiritual culture which provides a flavour of bhakti yoga - the yoga of love! The Sunday Feast is open and welcome to both congregants and newcomers alike. Festivities kick off with “rocking” kirtan (musical mantra mediation) and continue with more chanting, drumming, a spiritual discourse and a free vegetarian feast served to all attendees! Festivities begin at 4:30pm and continue to7:00pm. We extend a warm invitation to both the spiritually-seasoned and the somewhat curious to come and “feed your soul” at the Hare Krishna Sunday “Love” Feast!